A call from Captain Picard’s (Patrick Stewart) old friend, Captain Walker Keel (Jonathan Farwell) of the starship Horatio reroutes the Enterprise from its visit to Pacifica. Keel asks Picard to rendezvous with him in secret, and meet with two other Starfleet captains too, Captain Tryla Scott, and Captain Rixx. Only reluctantly, Picard agrees to the clandestine meeting. When the group meets, Captain Picard hears about a conspiracy in Starfleet, mirroring reports he heard from Admiral Quinn (Ward Costello) some months earlier. After the rendezvous, the Horatio is reported destroyed, confirming for Picard his old friend’s story about a dark conspiracy. Data (Brent Spiner) is able to determine odd patterns in Starfleet’s recent actions, as well. Captain Picard orders the Enterprise back to Earth, where he investigates the presence of a conspiracy in Starfleet Command. What he finds there is almost unbelievable. Alien parasites have taken over the Admiralty, and are subverting the Federation. Admiral Quinn has also been compromised by a parasite, as has his adjutant, Remmick (Robert Schenkkan). Apparently “Conspiracy” is a divisive episode, with some long-time fans loving it, and other fans hating it. My own assessment is that this title is one of the best, and most exciting episodes of Star Trek: The Next Generation’s (1987-1994) first season (and indeed, of the series in its totality). Why? “Conspiracy” feels downright dangerous. There are moments in the episode that are unpredictable, and filled with real, sinister menace. At one point, it looks like Captain Picard will not escape from the parasites. Offhand, I can think of only one other episode that is as terrifying and unpredictable as this one: “Q-Who,” which introduces the Borg. Too often in The Next Generation, menace and danger are undercut, or underplayed. So many stories in the first season don’t feel immediate, or urgent. The characters stand on the command bridge of their perfect starship, with their perfect ideals and philosophies, and get to talk down to planets and people who are not as evolved as they are. The drama in the storytelling lessened via this approach, and the lack of action adds to the feeling of the series as a sustained academic lecture, rather than a scintillating entertainment. 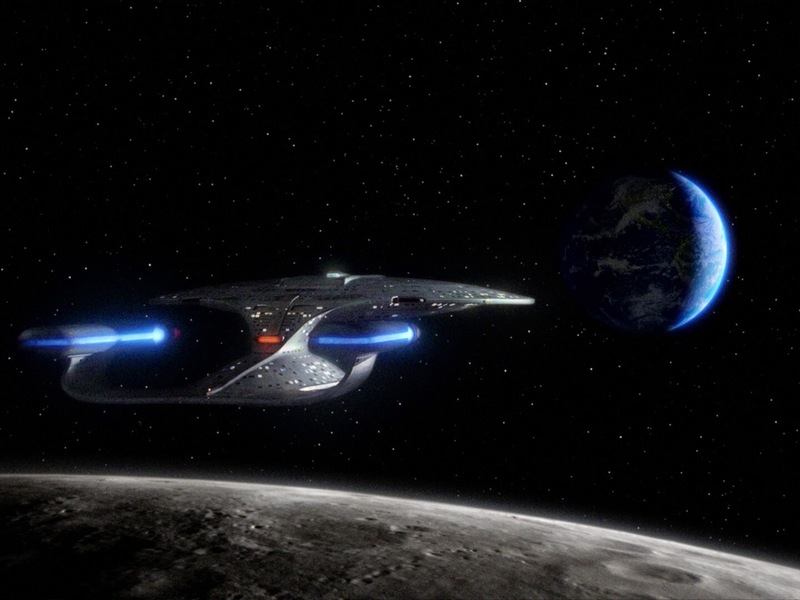 None of those things are true in “Conspiracy,” which takes the Enterprise back to Earth (for the first time in the series), and into the hive of the conspiracy. The episode is a real life commentary on the Iran-Contra scandal of the day, which saw “patriotic” generals turning against the ideals of the Constitution to pursue their own radical ideological agenda. By my count, “Conspiracy” is the third time the series had taken on the scandal. “Q” appeared, basically, as Ollie North in “Encounter at Farpoint,” mocking the colonel’s brand of self-serving patriotism. Then “Arsenal of Freedom” dealt with the arms-dealing aspect of the scandal. And, finally, “Conspiracy” tackles the “enemy within” nature of American patriots subverting the law for their extremism. It would make an interesting paper, for some academician, to write about Star Trek: The Next Generation’s responses to this scandal of the Reagan Era. Another strength of “Conspiracy” is the episode’s chilling ending, which has Data announce news that the parasites have sent out a beacon to their distant brethren. This code is one worthy of The Twilight Zone (1959-1964) and feels haunting to this day. The episode ends with the sounds alien messaging still “going out” to the final frontier. I understand why the episode is controversial, however. In part, that controversy it concerns the hypocrisy of Gene Roddenberry. I remember reading an interview in Starlog Magazine with the Great Bird of the Galaxy after the release of Star Trek II: The Wrath of Khan (1982), in which he complained about Kirk phasering (to death) the Ceti eel that emerged from Chekov’s ear. It was a new and unknown life-form, Roddenberry insisted, and should have been studied and investigated. Instead, it was met with disgust and violence by a Starfleet officer. 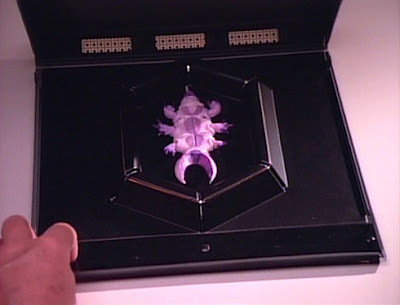 So what does Picard do in “Conspiracy” when faced with a similar parasite? He grimaces, just like Kirk, and blows the thing away without a second look. Picard’s actions are appropriate given the threat level here, but they also reveal that Roddenberry’s complaints about the Wrath of Khan were not valid. It’s amusing how Captain Picard’s log entry in the denouement of “Conspiracy” attempts to paper over the rampant phaser blasting. He notes how repugnant it was to destroy life, after years of respecting it, but that he had no choice. 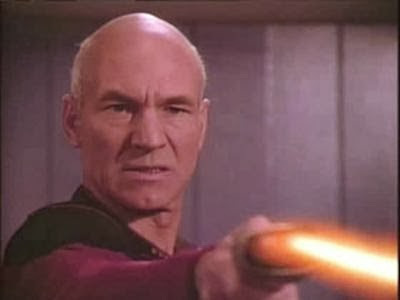 So I suppose some Star Trek fans dislike the episode because Picard acts in a way that might be deemed out-of-character, blasting an alien “mother” creature to kingdom come. But again, in the context of what was at stake, who can blame the guy?! Not every problem can be solved by mediation or arbitration, even in the 24th century, and “Conspiracy” is a prime example of that fact. There are some life-forms that may say they desire “peaceful co-existence,” but what they really desire is conquest. Part of the reason that “Conspiracy” works so well is that some of the elaborate story set-up was delivered in the earlier first season tale “Coming of Age,” and so this episode can actually take the time to develop suspense, and deliver action, without too much exposition (save for in the first act.). It is rewarding that as early as its first season, Star Trek: The Next Generation was beginning to experiment with serialized story-telling, which would become a mainstay of DS9, down the road (and then Discovery, of late). Basically, “Conspiracy” is just so weird, and unlike any other TNG episode, and that makes it a special hour. We see an old man (possessed by a parasite) beat up Worf, and then get phasered to the ground by Dr. Crusher, in a stunning and dramatic scene. 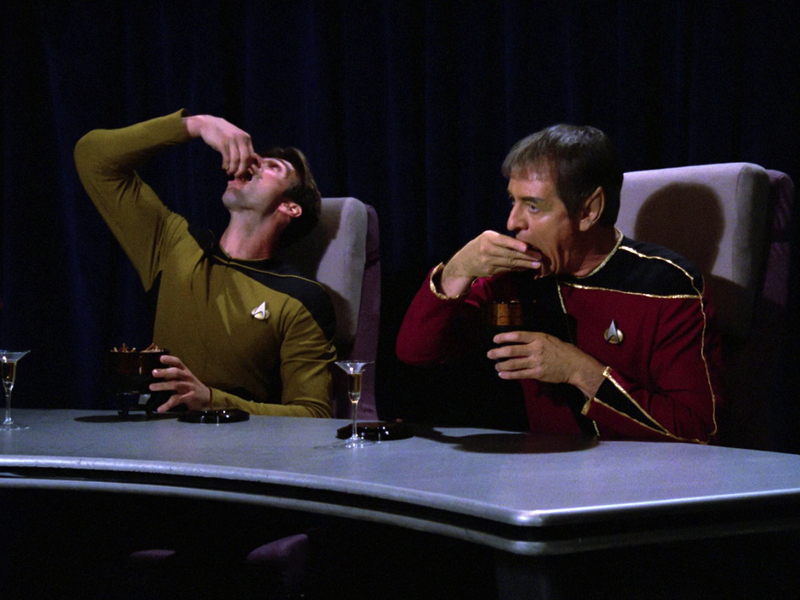 We see Starfleet admirals dining on worms. We see parasites crawl inside a human mouth. We see a human head explode. And we’re left with the ultimate mystery. What are these things? And finally, we are also left with the fear that they will return. As I’ve written before, the first season run from “Heart of Glory” through “The Neutral Zone” was a beautiful time for this fledgling series, in that the program writers were finally starting to get down the right mix of cerebral science fiction and colorful action. “Conspiracy” is likely the apex of that formula in the first season, an episode that scares, shocks, and delights, even on repeat viewings. 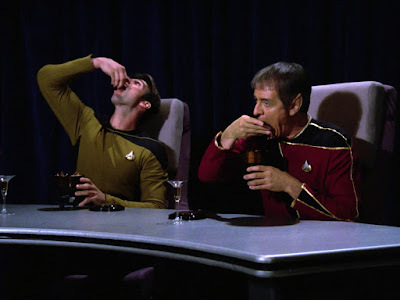 I wish there were more episodes like “Conspiracy” in the TNG canon. I watched a small batch of TNG episodes a few years ago; "Conspiracy" was one. I liked it when it first aired and still do. It's a top episode for me -- of the forty or so I watched during the show's run. A relative gem in a, for me, generally okay series. In the age of Trump, "Conspiracy" has added punch. One of the best of the first season, if not the best one. Still, I did include it only as an optional 2nd tier episode in my own list. Maybe because it's not time paradox, Q, Romulans, Klingons nor on of the great moments considering meaning of life with Picard (my favorite). This episode just feels so separate from the rest of the whole show. Maybe if they had continued with the parasites later it would have worked better. Before I begin, I have to say THANK YOU for putting up that picture of Picard, grimacing as he blows that space slug to hell. My friends and I got lots of mileage from that when we first watched the episode when it originally aired. We thought it was hilarious. That probably wasn't the reaction we were supposed to have, huh? It's because we hated "Conspiracy." I thought it was more than a little gratuitous. The writers were clearly chomping at the bit for a real menace for our perfect Federation heroes, but I think they went a bit over the top with this one. Mmm, space worms! nom nom nom! Although I may be in the minority here with my opinion, and thought the ending "they're coming" bit was a tired rehash of an old sci-fi trope, I could see where they were going with it and what they were trying to do with it. T.S. is correct that a follow-up would have been nice, but there's a part of me that's glad they never pulled the old phaser trigger on that one. Of course, by the end of the series, I was convinced that my Grandmother could've beaten up Worf. We were seeing the beginning stages of what would become known as "The Worf Effect" (speaking of tropes). Still, one might argue that, were it not for this episode, we might have never gotten the truly great threat to the Federation...the wonderful Borg. It took them a while to get there, but the writers found the perfect nemesis as a direct result of "Conspiracy."